The weather has been beautiful here in Florida, so naturally families are flocking to the beach to spend some time in the sun with their loved ones. 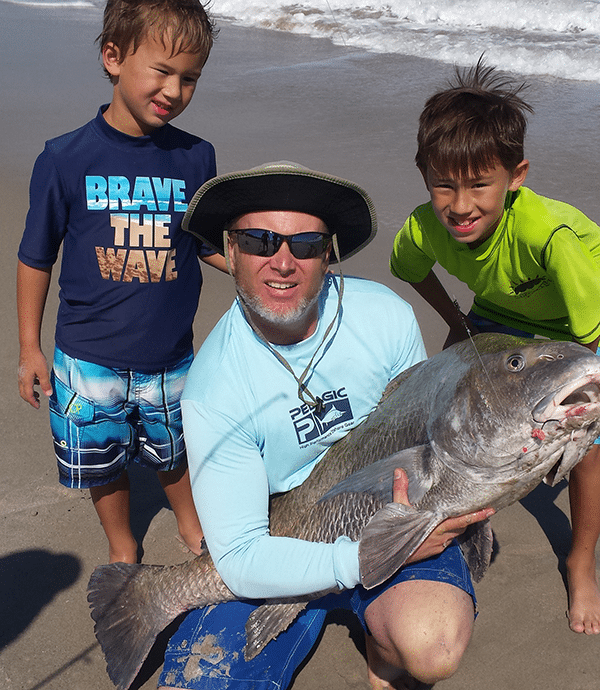 A few days ago Brent took his two sons fishing at their usual spot located at Ponce De Leon Landing in Melbourne Beach. They settled in and set up four rods in the surf, each with different rigs and bait. Brent’s youngest son, Chris (7 years-old), was at the end of the line with his 6 foot Ugly Stik that was rigged up with a pompano rig and a piece of crab flavored Fishbites. After some time Chris yelled that he had a fish, which is when Brent looked over to see that Chris had already removed his pole from the sand spike and was trying his hardest to reel in his catch. Brent saw that his son was having a tough time, as the fish kept running with his line, so Brent stepped in to help reel in the beast. By now many onlookers had gathered thinking they were fighting against a shark, but Brent could see that there was something more rewarding at the end of the line. While it took Brent’s strength to land the beast, he admits that it was Chris’s determination that kept him going. He stayed right next to Brent, coaching him on how much fight to give and when to let the fish run. Once they pulled the fish ashore they worked fast to gather measurements and snap some pics of one of the biggest Drum they have ever seen! This big guy has lived a long life at sea and earned his right to return after putting up such a fight, so they released him back into the ocean. Thanks again for sharing your story Brent and Chris! And thank you to all of those who have sent in photos!